I don't know if this really fits in the plant breeding section, but there is no other section it seems to fit. But I came up with a new idea I think I'm going to do. 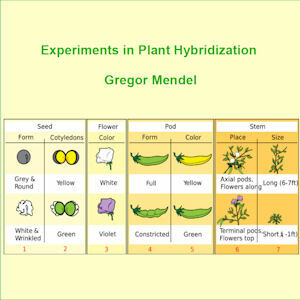 I'd like to make a pack of seeds of all the traits mendel worked with for people or kids or schools. They could plant all the traits side by side or even start learning about plant breeding with them by recreating mendel's crosses. It's pretty simple, but I think it will be cool. I plan on making a simple pamphlet to go with it that explains a little on how to cross pea flowers and such. I plan on making the pamphlet open source or creative commons or something. These are the varieties that I have that seem best for this. White flowers = Virescens Mutante, Mummy White, Large Podded? Green seeds = Mighty Midget? Wrinkled seeds = nap gene, midnight snow, etc. I don't know enough about pea varieties to know which pairings might work. For example, since "White flowers" is on the list, I presume that there should be a corresponding colored flower. And since there are wrinkled seeds, and green seeds, that there should be something like smooth seeds and not-green seeds. And since there is a "Dwarf", should there be a giant? Yeah, so basically mendel studied 7 traits in peas and either lucked out enough that he found corresponding alleles or only wrote about the ones that did. But yes, the opposite of white flowers is purple flowers (or more specific the wild type bicolor purple found in field peas). Yellow pods vs green pods, yellow cotelydons vs green cotelydons, and Round vs. Wrinkled seeds. The dwarf would just be any short node pea. Or similar to Bush phenotype vs indeterminate tall vine. I chose "extra dwarf" because it is really really short although there are other short peas out there. I'm not sure which dwarf mendel used, but presumably any could work. There are a couple competing products like Wisconsin Fast Plants and corn kernel counting kits. That's true William, Carolina Biological has some, I actually thought about that today. Though, I don't necessarily think of them as competing but as complimentary. In fact I think they and others might be interested in a pea pack as a more interesting alternative for those who would be in the market for those types of kits anyway. I mean there is just something cool about Mendel. P.s. Mendel's original paper and attention to scientific and mathmatic detail was inspiring! I particularly liked the end section where he talks about non-mendelian traits and blending and work by other plant breeders of his time! I listened to it on Google Podcasts. So, for this project these are basically the varieites i have in my collection that might fulfil these criteria. These don't necessarily need to stay the same, but ideally some of them would. Any with wild type bicolour purple flowers. Those are all good points. I mean not all these may be the best choices for each trait so they can be replaced by better ones really. But there is going to be some overlap for multiple traits and in some ways that might be a good thing. I think I only said Midnight Snow for green seeds because i'm not sure how many I have that have green seeds right now. Mighty midget used to be mostly green seeds, but I think they might be mostly yellow seeds now. Not sure if Joni's Taxi had purple flowers, but it might actually. I'm working on my own good tasting yellow snow pea that most likely will have purple flowers when I refund the ones i'm looking for. Saw it a few seasons ago but the seed got mixed in with all the other yellows which included yellow snap peas. It had the nice "pulverize to dust" trait which I think means it was POV for double dose of low fiber Gene's in the pod. But yeah maybe it would be best to leave out any purple podded types.